How time flies! It's now seven years since 47 Labs introduced the hi-fi world to their Gaincard amplifier, thus starting the chip amp craze that swept both the DIY community, and commercial market. Despite the arrival of the (almost) equally simple class-T amplifiers, the analogue chip amps continue to prove popular, as confirmed by the arrival of yet another commercial offering, the 'Stevie', from Garageaudio in Italy. Over those six years, we have seen the chip amp in many variations, one of the most popular being the addition of some kind of buffer, or pre-amp stage. 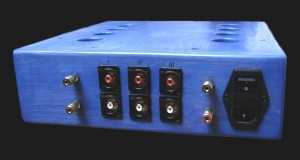 Following a design published by Joe Rasmussen of JLTi (the commercial version of which was reviewed here on TNT-Audio) many people, including myself, built valve buffered chip amps, and attempted to take the design a stage further. And that brings us to the subject of this review, the 'Stevie', an integrated chip amp from Garageaudio, that uses a valve based pre-amp stage. Rated at 30 watts per channel, the 'Stevie' uses the E88CC valve, and audiophile components including an ALPS Blue pot for volume control. There is provision for three inputs, the source being selected from a rotary switch on the front panel next to the volume control knob. Also on the front panel is a small round 'window' enabling you to see inside to where a valve is backlit with blue light. All quite 'normal' you may think until you see 'Stevie' in the flesh, or rather in the wood because it's not a piece of hi-fi that you can ignore! It has to be said that the looks are certainly an acquired taste although I find it looks better than it does in the pictures. At the risk of blowing any credibility I may have, I'll state here that when it comes to sound, I prefer my amplifiers in a wooden housing compared to a metal one! Perhaps it is a psycho-acoustic thing, but the music just seems more organic. So, I commend Garageaudio for going with a wooden case but I'm not sure how many potential customers their bold design will appeal to! I think we can safely say that people are either going to like the design or hate it. It's not that wood finishes are unusual in hi-fi, it's just that they are usually a natural finish. The dragged paint look is very much a personal thing, and while it was popular on kitchen cupboards a few years back, I'm not so sure it will fit in with that many decors. Anyway, enough of the aesthetics and on with the review. The Amplifier was extremely well packaged and arrived all the way from Italy with no sign of any damage. After taking it out of the packaging, I connected it up to the mains, turned it on and measured the DC offset. The readings on my meter were 19 mV for one channel and 86 mV for the other. These are fairly common figures for the LM3875 chips and won't cause any problems. There is no nasty sound when 'Stevie' is powered up but there is quite a loud 'thwack' when the amplifier is powered down. To avoid the turn-off noise, the volume control should be set to minumum before removing power! I couldn't help but be impressed by the sound of this amplifier, particularly the lower end of the frequency range. The bass was probably the best I have heard from a chip amp (certainly one using the LM3875), well controlled, powerful, and deep. It actually had me wondering what exactly Garageaudio had done to achieve such a good bass performance. The mid-range and top end is clear, detailed and smooth. In fact very familiar to anybody who has heard a well implemented LM3875 based chip amp. Sound stage is wide with good depth and imaging is clear. All in all, an extremely pleasant sound and one that I found kept me rooted to the listening seat. The overall tone of this amplifier is slightly darker than other LM3875 amplifiers that I have listened too. This was particularly noticeable on an AL Stewart CD where his vocals, and more so, his guitar, sounded slightly strange: deeper and slightly less clear than I am used to. Overall, I rated the sound of the 'Stevie' as very good, akin to one of the better chip amps, with balls if you like, the bottom end being particularly commendable. As for paying 900 euros for it, well I'm not so sure. I know full well how much it costs to build anything like this, market it, and still make even the smallest profit. But the hi-fi market is quite competitive, more so since China started flooding it with some real bargain hi-fi. I am a big fan of the chip amp, I still use them in my main system, but the big difference is that mine are DIY and still represent very good value for the comparatively small outlay. At 900 euros, 'Stevie' has to be considered against a host of other amplifiers in that price-range. I'm not saying that its sound quality isn't worth the outlay, there will certainly be worse sounding amplifiers that sell for more money. It's just that with the somewhat 'home-made' looks, it may not have the perceived value to attract potential buyers. 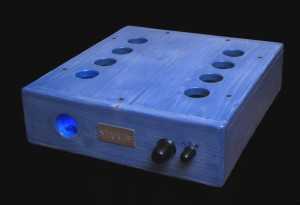 Of course, a hand-made amplifier may appeal to you. There is an awful lot of work in 'Stevie', even down to hand engraving the name-plate. At least you will own a one-off as none of them will be exactly the same as another! In short if you like the Gainclone 'sound' this is probably as good as it gets. If you like the look of 'Stevie' too, it is certainly worth an audition! I would like to thank Nick Whetstone, Lucio Cadeddu and the whole TNT-Audio staff. I've found honesty, objectivity and courtesy in these people. I completely agree with the opinions expressed by the reviewer and I'm happy he has been able to underline the sonic character of our product, including a fair opinion on aestethics and finish. Our amplifier has received a fair review, not too bad nor too good, as it happens (too often!) on Audio mags which call a product a miracle way too easily. Our amplifier has been tested and evaluated carefully, with the heart, ears and brain, as it always should be.